This vessel is a very well preserved kernos ring from Megiddo. The term kernos (plural kernoi) is borrowed from Greek archaeology and refers to a pottery ring with small vessels for holding offerings. As the borrowed terminology suggests, kernoi may have originated in Cyprus or elsewhere in the Aegean, and been brought to the southern Levant by traders or immigrants. Although fragments of four others were found in Megiddo, this example is the most intact. It is made of baked clay and originally featured eight attachments, of which seven have survived. These include a cup, two doves, two pomegranates, one jar and an animal previously thought to be a gazelle but more recently identified as a bull. The prevailing view is that kernoi were ritual vessels, perhaps used for pouring libations. The liquid (likely wine, oil, or milk) could be poured into one of the attached vessels and would run around the hollow ring at the base and fill up the other attachments, which could either be drunk from or used to pour out the liquid. Libation rituals are widely known in the Hebrew Bible and seem to have been a part of daily religious life that anyone could enact anywhere. An example from Jeremiah 19:13, announces judgement on the inhabitants of Jerusalem because they have poured out libations to 'other gods' (that is, gods other than Yhwh) on the roofs of their houses. Jeremiah 7:18 similarly accuses the people of Judah and Jerusalem of pouring libations to the 'Queen of Heaven'. These texts suggest that libation rituals were widespread in late seventh century Jerusalem and Judah. Another example of a kernos is the Tell el-Hammah Kernos. 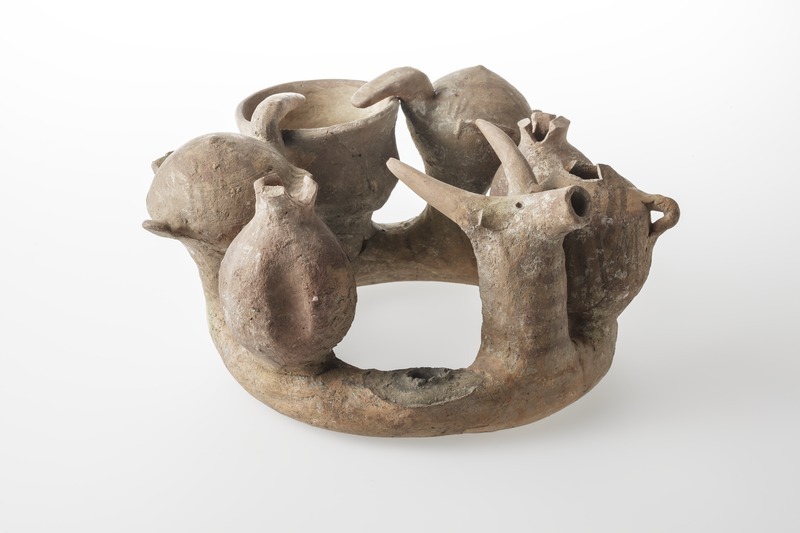 Clay kernos ring with seven attachments (originally eight). Height: 13cm; Width: 25cm; Diameter: 20cm.